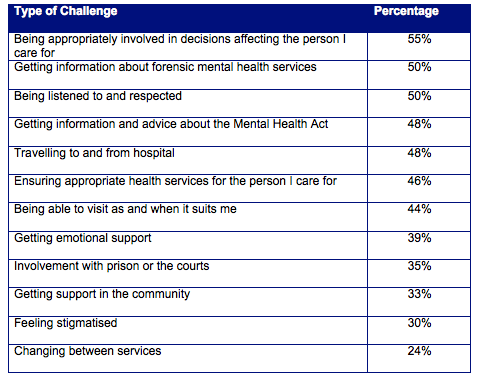 Respondents reported a range of emotional impacts of caring for a relative detained in forensic mental health services, including feelings of guilt and responsibility or, at times, feeling powerless and helpless. One survey respondent expressed satisfaction with regard to all the areas suggested as possible challenges for carers, so clearly some forensic carers are having their needs fully met. Other responses imply there are inconsistencies in supporting carers, between different units and sectors of the forensic mental health services, and between different staff. It was not untypical for a transition between units to bring different, more or less supportive, practices into stark relief.